I read the first book of this series (An Ember in the Ashes) and couldn't wait for the next! 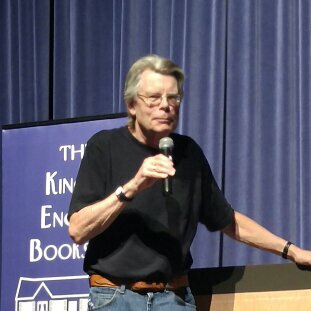 A few months ago I bought a ticket on a whim to see Stephen King. I almost didn't go. When the day came I was tired. I almost gave the tickets to someone else. I mean, I haven't read too many of his books. Well, I've only read one of his books and it was the writing book. I tried to read CARRIE in eighth grade but didn't get far. I have seen quite a few of his movies though and my favorite is The Shawshank Redemption. It's probably one of my top five favorite movies. Do movies count when buying a ticket to see Stephen King in person?